I really appreciate that my kids love Art. And I appreciate even more that they get so many opportunities to create art at school. But there comes a time when your refrigerator just can’t hold anymore artwork! So what is a mom to do? Throw it away? I don’t think so – well, to be honest, that 100th coloring page from the princess sofia coloring book definitely just went in the trash! But some of the artwork is totally worth displaying and saving. With four kids, the artwork around here adds up quick! So quick that we have a strict no-refrigerator policy and instead built an easy art gallery in the play room to display their work. They can interchange the artwork easily when something new comes home. After a while we need a place to store the work that they have made over the years. I personally keep a plastic under the bed storage bin for each child that holds their collections of school and artwork from over the years. 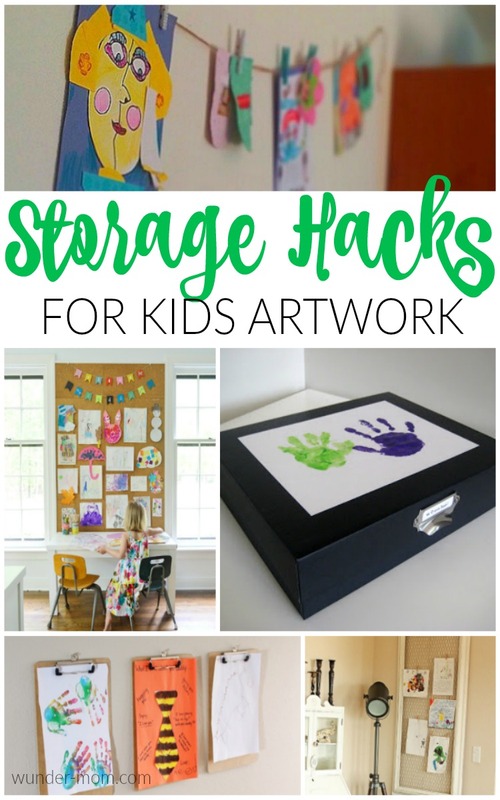 I found some amazing ways to display and store kids artwork – actually some are downright genius hacks – to share with you. Hope this helps! Thanks for stopping by Aubrey...I love the clipboards too, so many good ideas!